Since our last newsletter, we have started open-sourcing our networking stack and exploring strategic partnership. Continued growing TGI community & conducting 10+ podcast interviews. We have identified data availability and block propagation to be the main bottlenecks of scaling transactions with tens of thousands of (some potentially malicious) nodes over the Internet. Our insight is to use the RaptorQ fountain code in conjunction with a forward error correction scheme for broadcasting message blocks, without incurring round-trip delays to recover from packet losses, over adversarial networks. Here we’re launching our open source effort github.com/harmony-one with a go-raptorq wrapper under our umbrella project libunison (see our roadmap). Our libunison is an end-to-end and peer-to-peer networking library for any application that needs to self-organize an emerging network of nodes. The library is built upon existing standardized technologies, including Host Identity Protocol (HIPv2) and Encryption Security Payload (ESP), to leverage decades of research, development and deployment insights. Harmony is open sourcing libunison as one of the foundational layers of not only our network but also other performant, decentralized networks such as peer multicasts. Our team is growing! Chao Ma (Amazon AI engineer, Math Ph.D. at CU Boulder, non-linear analysis researcher) is joining the team to tackle protocol research and statistical consensus. Chao has been researching blockchain algorithms since 2017 and recently implemented a toy IPFS for fun. So did our good friend Li Jiang (GSV Capital, logistics startup founder, Northwestern University adjunct, nickname 蒋·和梦·犁). Li has been our evangelist since our first China trip in February and finally decided to jump off the cliff to lead Harmony’s partnership efforts full time. As the newest node with awe on the Harmony team, Li also serves as “Chief Frisbee Officer”to keep us active in the winter. We are planning our second token sale. 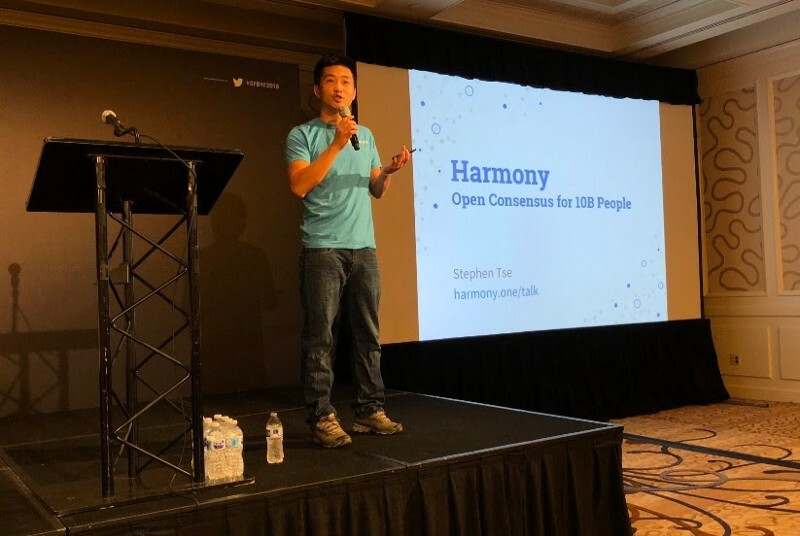 Inspired by these insightful articles by Multicoin and by Notation on value-adding investors as operators, we are asking our new investors to operate Harmony nodes. Scalability and decentralization are the two most important metrics for Harmony to succeed. We will achieve both by having tens of thousands of nodes, the scale of Bitcoin and Ethereum, run by many independent entities in jurisdictions all over the world. Having many nodes is key to network performance with our sharding approach; meanwhile having independent entities is key to network securitywith our permissionless principle. If you are non-US based and looking to participate in this strategic round, contact us at harmony.one/partners. Our colleague Prof. Lau has led our team with his research and submitted a paper “Blockchain and human episodic memory” (see preprint on arxiv) on relating brain consciousness to blockchain consensus. We highlight that certain phenomena studied in the brain, namely metacognition, reality monitoring, and how perceptual conscious experiences come about, may inspire development in blockchain technology too, specifically regarding probabilistic consensus protocols. Our colleague Ka-yuet Liu, also at UCLA, has published Data Marketplace for Scientists in our blog. She highlights a modern economic theory of the nonrivalry of data, concluding that “blockchain can turn wasteful competition between large-scale science projects into synergy” among internationally recognized scientists like themselves. Our testnet architecture has been updated to apply the latest research results and progress made by Ethereum 2.0. Zero-knowledge proofs by Starkwareare now fast enough to be generated on mobile clients and may be used to scale blockchains by many orders of magnitude. Fraud proofs (with 2D erasure codes and interleaved sampling), stateless clients (with algebraic vector commitment), comparing synchronous (with 10 exact round complexity vs previously 29) versus partially synchronous protocols, and integrating 99% fault tolerance (with hybrid threshold-dependent and latency-dependentconsensus) are on our roadmap. We continue to engage a global community to share the Harmony story. Here are just a few podcast interviewers and writers we are engaging with. Be sure to check out their work and keep an eye out as our stories will be published soon. Our conversations with these influencers span Silicon Valley, China, SE Asia, India, Australia and Brazil this month. Thanks to Jon Victor from The Information, Joyce Yang from Global Coin Research, Tushar Aggarwal from LunexVC & DecryptAsia, Brad Laurie also known as BlockchainBrad and Gerson Ribeiro from Startup de Alto Impacto for sharing our journey. 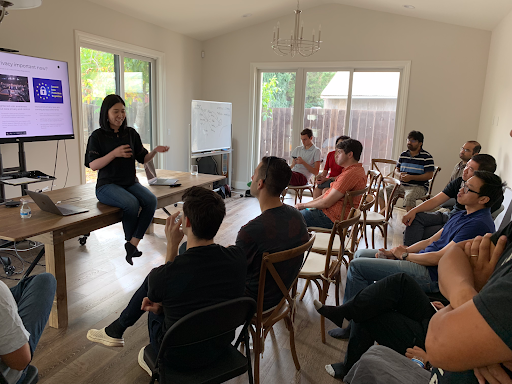 We are also hosting TGI-Blockchain on Saturdays now from 12pm to 4pm at our home-office for fellow founders and collaborators to deeply engage with each other. We are inspired by these builders presenting their works (sign up here!) every Saturday, including Timeless Protocol, Rational Mind, Blue Vista and Tara.AI in recent weeks. Our team is sharing our learnings globally at a recent talk in India and upcoming events in Hong Kong and online with TokenGazer, as well as meeting our local friends from the ABC Blockchain and Xoogler communities. We’re taking the top two points from Y-Combinator’s Essential Startup Advice(posted next to our coffee machine) to heart: Launch now, and Build something people want. We published a survey on blockchain testnets and we’re laser-focused on building our own public testnet, implementing information dispersal algorithm, state syncing and resharding at the moment. Lastly, we need your help on hiring database engineers to hack Byzantine agreements and broadcasts, and on bringing in strategic investors to run Harmony nodes all over the world!